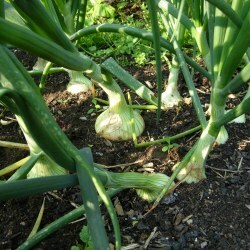 An easy to grow and store vegetable - makes it essential to learn how to grow onions. Few vegetables have more uses in the kitchen than onions, which means they are constantly in demand. Fortunately with the introduction of the Japanese varieties the June-July gap can now be filled... so learning how to produce an all-year-round supply comes easy with your newly acquired knowledge of how to grow onions. There is a slight increase in the risk of 'bolting' (running to seed) when using onion sets but modern varieties are much less prone to this. Don't buy sets that are more than 20mm(0.75") across and make sure you buy 'heat treated' onion sets - this treatment kills the flower embryo and helps prevent bolting. ...Maincrop onion seed or sets - sown or planted in late February to early April; depending on your garden's location. ...Japanese variety of onion seed or sets - sown or planted outside in early September for pulling in late June. ...Salad or Spring Onions - sown March to July for pulling from June to October. Sown in August you will get a crop March to May. Follow the planting directions below for each type and you will be successful, your knowledge on how to grow onions will be complete. Then as you gain experience through planting and experimenting you will discover how to best utilise your little patch of ground to get the maximum amount out. If you are sowing maincrop onion seed then prepare your onion bed on an open sunny site that has good drainage. Most exhibitors grow onions from seed and understand that good soil preparation is essential before planting their onions. They prefer to grow them in a permanent bed in order to build up the soil fertility - knowing how to grow onions is second nature to these guys... but they had to learn first! But for folk like you and me who want to know how to grow onions so we can just eat the stuff - There is the danger of building up diseases as well as soil fertility. Let the onion bed rotate with the rest of the vegetable garden. So where were we... oh yes, planting maincrop onion seed. Dig the bed in autumn to let the ground settle and allow the frosts to break down the soil clods - onion seeds will require a fine tilth to be sown into and the frosts will do a great job of this. Dig in plenty of well rotted manure or, add lime if soil is acid, onions like a pH of between 6 and 7... don't become too obsessed by these values, it is helpful in knowing how to grow onions but needs to be included with all the other necessary info - a soil that is pretty neutral (6 - 7.5) will serve you fine. It is a good idea though to know the approximate pH value of you soil by purchasing a testing kit. A good tip when learning how to grow onions is to pick a dry day a few weeks before sowing time and rake down the soil to a fine tilth, at the same time rake in a general fertiliser like Growmore. Onions like a firm bed so tread over the area you have just raked... remember if the soil starts sticking to your footwear in large sticky lumps then it is still too wet, wait for another day. Once you have trodden over the bed where the onions are going to grow rake it over again into a fine even tilth. Well that's your bed prepared... but you have no time to lay on it, let's get on with the planting. 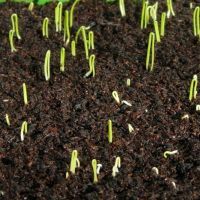 Sow maincrop onion seeds as soon as your soil allows you to - late February to early April for an August or September crop. Sow the onion seeds very thinly into drills 13mm(1/2") deep, in rows 23cm(9") apart. Carefully cover the onion seed with soil and gently water in. Germination will take approximately 21 days. 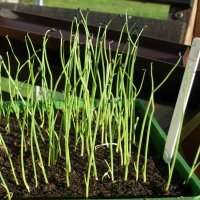 Thin out your onion seedlings when they have pushed through the soil and are standing vertical to about 25mm(1")-50mm(2") apart and then again later to 10cm(4") apart. Lift the thinnings carefully... make sure the soil is moist. It's important to clear the thinnings away from the onion bed so not to attract the onion fly. 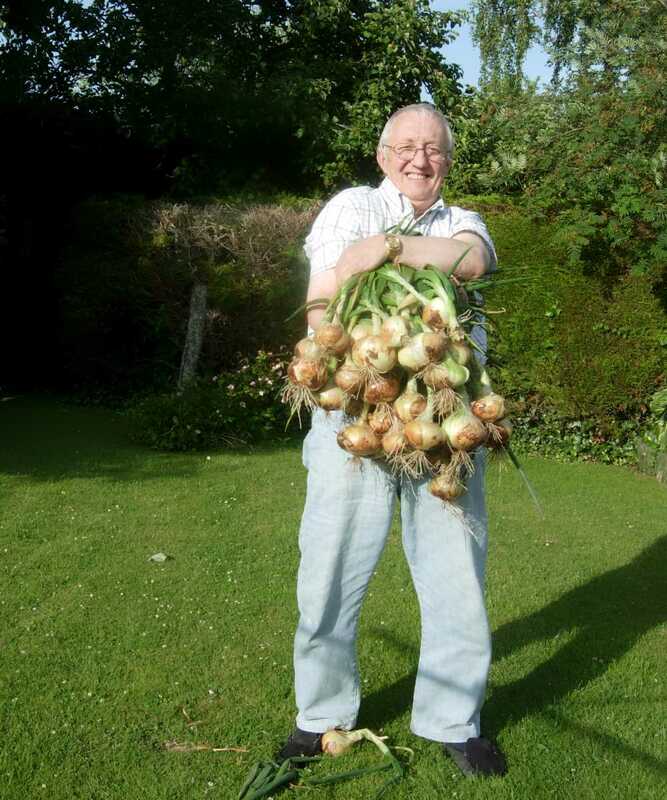 Gardening experts have learnt from experience how to grow onions for the big competition bulbs which win shows. Maincrop onion seed are sown under glass in January for an earlier crop and for growing those exhibition bulbs. Transplant them in rows 10cm(4") apart and rows 23cm(9") apart. Transplant the onion seedling firmly - ensuring the root falls into the bottom of the hole and is not gathered up around the onion bulb area... the base of the onion should be 13mm(1/2") deep. Learning how to grow onions from seed can be difficult in some areas because of the short growing season e.g. the colder areas of northern Britain. The alternative is toknow how to grow onions from sets. These are small immature onions raised by specialist growers from seed one year and planted by gardeners the next spring to grow into mature plants. 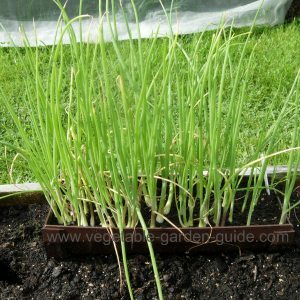 Whilst it's true all onion plants require a good, free draining soil, onion sets are not as demanding - this is especially convenient for those of us who are new to gardening and are just learning how to grow onions. Prepare the onion bed as for onion seeds above but they don't need the same high organic content as seeds or the fine tilth for sowing. When you purchase your bag of onion sets empty them into a tray if you are not planting immediately and keep in a cool, light place to prevent premature sprouting. Cut off any excess dead growth from the growing tip so this doesn't become a handle for birds to pull them out of the ground. Plant out your onion sets mid March to mid April... 10cm(4") apart in the row and between-row distances of 23cm(9"). Make a small hole in the soil with a trowel then pop you onion set in so the growing tip is just below the surface and firm the soil around it. Water in. Japanese onions are very similar in taste and appearance to maincrop varieties but they do not store well... but that's ok because you will not need to keep them very long before your maincrop onion plants are harvested. Apply a general fertiliser like Growmore two weeks before sowing your Japanese onion seed in mid August... just follow the instructions above for 'maincrop onion seed sowing and thinning distances. It is preferable to sow Japanese onion sets for all the reasons stated previously. Apply a general fertiliser before planting. Plant out from early September to mid November... follow the planting distances above. Come March apply a general fertiliser and if the ground is dry begin watering to help swell the bulbs, ease off the watering as summer approaches and the bulbs begin to ripen. Spring onions should be sown from March to July in short rows 13mm(1/2") deep and 10cm(4") between rows. Thin them out to 25mm(1") if you want more developed salad onions but it is not necessary. Sowings should be repeated every three weeks so that you have a supply for your salads throughout June to October. Sow a few rows in August for eating in March/May. But... there's always a but :0) - if you are very short of space grow some in a container filled with potting compost. The picture on the right shows how I successfully grew spring onions in a piece of guttering. If I wanted to, I could have slid these spring onions out as young seedlings, along with its compost into rows in the open ground. It's amazing what you can use when you play around a bit... with the veg gardening I mean. Learning how to grow onions the conventional way is only the first step. 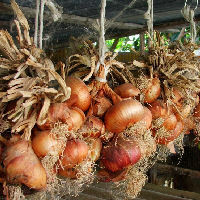 Below are important points to remember so that you know how to grow onions of maximum yield. Keep weeds down as to much growth will affect the quality of the crop. Preferably weed by hand as onions hate having their roots disturbed. Feed occasionally with a liquid fertiliser and water the onion plants if the weather is dry... but not otherwise. Apply a mulch to keep weeds down and conserve moisture; don't cover the swelling bulbs though, as they need to be exposed to the sun. Cut off any flower stems that appear - you want all the plants energy going into swelling the bulb and not setting seed. Stop watering once the onions have swollen and begin to ripen. There is nothing more demorilising in vegetable gardening than having taken the trouble to learn how to grow onions and other veg then have some nasty little pest or disease come along and destroy your efforts - it happens, but we need to minimise the attacks by operating good practices and husbandry and to know who the enemy is. Onion Fly - maincrop onions from spring sowings are the most likely to be affected... around May/June time but problems can occur right up to September. Onions grown from sets are less vulnerable - these are always the best option if you just intend to eat and not show your onion plants. The onion fly resembles the house fly and lays its eggs in the soil near to the onion plants. When the grubs emerge they burrow into the onion bulbs and eat them away. Signs of attack are yellow drooping leaves. Pull up infected plants and burn them or ensure they are destroyed. Do not leave thinnings hanging around as these, disturbed roots and damaged leaves put the onion fly onto the scent of their prey. There are chemical deterrents available so visit your local garden centre and ask their advice. Eelworm - look like minute transparent eels but are invisible to the naked eye. An infected bulb could contain millions of these pests. If they are present in the soil which you plant your onions into (Chickweed is a host of this eelworm - important to keep a weed free onion bed) then secretions from the onion plants roots cause the cysts to come to life... the eelworms will then burrow into the onion bulb and up into the stem. The foliage and stems then become distorted, the bulbs swollen and soft. Burn all affected plants and do not grow onions on that piece of ground for five years - or beans, strawberries and peas as these are affected too. Neck Rot - grey mould appears near the neck of onions that are being stored... the bulbs become soft and rot. There is a greater risk of the fungus developing if the onion bulbs have been damaged - whilst hoeing for example, or have not been allowed to properly dry out after harvesting and are then stored in a damp and poorly ventilated area. You are asking for trouble if you try and store onions with green, fleshy necks. 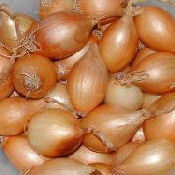 There is no treatment so inspect your stored onions frequently and remove any that are rotting immediately. White Rot - hot, dry summers may encourage this growth on your onions. 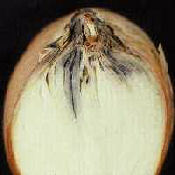 The leaves turn yellow, the bulbs rot and the base of the onion is covered with a growth of whitish/grey fungus with round black bodies appearing within the fungus. There is no treatment except to lift and burn diseased plants. White rot is a serious disease so don't grow onions on that piece of ground for eight years. Harvest maincrop varieties August to September Harvest Japanese varieties June to July Harvest Spring onion varieties March to October. The onion bulb is mature when the foliage turns yellow and tips over - leave for another couple of weeks before lifting. Choose a dry day. If the onion bulbs are ripe they can be pulled by hand but easing them out of the soil carefully with a gardening fork will ensure no damage occurs. If the weather is dry and settled they can be laid on the ground on some sacking or if possible raised up a 25-30cm(10-12") onto wire netting nailed onto four posts creating a cradle. They can then be left in the garden to dry out. 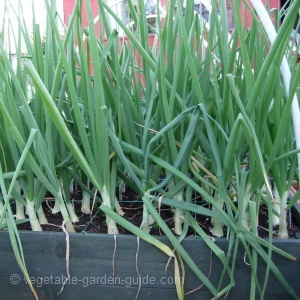 If the weather is wet lay the onion plants in trays or on sacking indoors somewhere, where it is well ventilated. Depending on the temperature and size of your onion bulbs - I'm sure they will be good healthy specimens by now - it will take approximately 2-4 weeks for them to dry out and cure. A good tip for knowing how to grow onions is to inspect your onion bulbs carefully and all soft, spotted and thick necked onions should be separated for your current cooking requirements. Store the rest. As already stated Japanese onions are not good storers but you will not be keeping these as long as your maincrop onions. The most convenient way to store your onions is to create an onion rope. Just take a stout piece string or twine and tie the two ends together to form a loop. Hang it from a support so it dangles then proceed to tie the onions into it by plaiting the dried foliage around the string. There is something very satisfying about the result. You can also use trays, net bags or even a pair of ladies tights... get permission first, mind you. Dry onion bulbs thoroughly. Store only undamaged and hard onion bulbs. Only store onions in a cool well ventilated area. The spring onions should be pulled when they have grown to approximately 13-25mm(1/2-1") across. Well it's up to you now, all the information on how to grow onions is at your finger tips - no excuses now just get out into your garden and start preparing and... bon appetite!